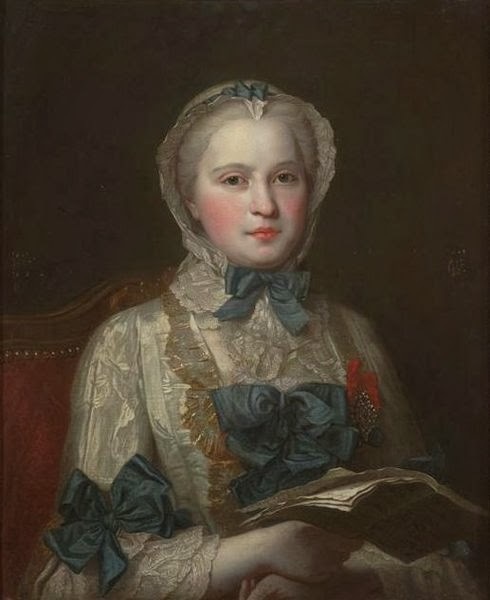 The heavy white make-up and painted red cheeks of 18th century French aristocrats is, to some extent, a caricature reinforced by film and theatre. Highly exaggerated make-up of this sort was associated primarily with the Court, with Baroque overtones of both artifice and sexual freedom (see the article by Dominique Paquet) Louis XV decreed that when his daughters came of age they should wear rouge - a custom also imposed upon the foreign born Dauphines, Marie-Josèphe de Saxe and Marie-Antoinette. Make-up functioned in this way as a mark of aristocratic distinction - though niceties easily became muddied under the competing demands of social mobility, blossoming consumerism and changing fashions. Make-up was, of course, always intended to enhance the complexion and beautify as well as serve as social statement. Even early in the century, men (and women) were not immune to the allure of natural beauty. 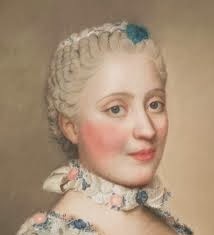 Significantly, it was said that Madame de Pompadour's heavy make up - defiantly on show in Boucher's famous portrait "à la toilette" - was a departure from her former more bourgeois habits when she had used only a hint of rouge to highlight her famously creamy white complexion and sparkling eyes. (See Melissa Hyde, p.458). As Morag Martin has demonstrated, the period saw considerable changes both in social conditions, moral attitudes towards cosmetics and commercial context, with the main trend the move towards more simple fashions and a "natural" look by the 1780s. The stark white skin, brilliant red cheeks and black silk patches of Versailles were replaced by the desire for a naturally flushed skin and an open, honest countenance free from artifice. A variety of evidence - beauty manuals and medical treatises, advertisements in journals (which first appear in the 1750s), stories, anecdotes, diaries - testifies to a burgeoning cosmetics industry. By the second half of the century the emphasis was definitely on health and skin condition: rouge to give the impression of healthy complexion; creams and pomades to whiten and soften the skin, scented waters to care it. Shop-bought cosmetics also became readily available to a much wider spectrum of women. Definitions - "Parfum" "Cosmétique" "Fard"
Again according to Morag Martin, the literature used the term "Cosmétique" for both makeup and creams, but as distinct from scents and parfumerie. A subcategory was defined as "fard" - face paint to hide imperfections and give the illusion of colour. The latter divided into "blanc" and "rouge". In fact, especially when it came to home prepared products, the strict distinction between fragrance and cosmetics is a little artificial. Toilet waters, though primarily employed for their scent, were used in a variety of preparations and, in an age where bathing facilities were scare and suspect, deemed to have health-giving properties in their own right. Here is an alcohol-based "Hungary water" among a number of recipes from a traditional grimoire, Le Petit Albert. The second ubiquitous component of cosmetics was pomatum or pomade - a thick scented cream, usually containing water, animal fat, almond oil or beeswax and apples. Its primary function was to dress hair, but it was also used as basis of face creams and cleansers that could be applied using the fingers. It could be prepared at home and, by the 1740s, bought in a profusion of different varieties, perfumed with lemon, citron and bergamot as well as the more traditional orange and jasmine. Later in the century it was often sold in the form of solid sticks. The dominant aesthetic demanded whiteness of skin to signal respectability and class. Women took elaborate precautions to shield their skin from the sun. However the application of heavy make-up came to seem more respectable than naturally white skin. White make-up was none too healthy because predominantly made with metal based compounds, the most expensive of which was ceruse or white chalk of lead (lead carbonate); bismuth compounds or aluminium sulphate (alum) were also widely used. These were finely powered then blended with oils. According to Morag Martin, although "blanc" was "the most suspect cosmetic of all due to its noxious ingredients and ability to mask the wearer's true self", many women justified it as a means to cover blemishes or smallpox scars. Nonetheless, Catherine Lanoë - surveyed 15 different beauty manuals, published between 1541 and 1782 - was surprised to find that recipes using ceruse did not refer to "fard", the term which usually implied heavy "paint". It might be that that simple white paint or powder was too commonplace to mention, or maybe the term attracted too much opprobrium to be used comfortably. Surviving recipes, however, often feature creams and washes to whiten the complexion rather than the solid mask of foundation often assumed in modern recreations. The effect was a translucent pallor rather than a layer of opaque white pigment; some at least of the preparations were certainly intended to be applied in the evening and worn overnight rather than as day make-up. Earliest recipes emphasised preparations that could be "scrubbed" into the skin to lessen blemishes but in the 18th century the general emphasis was on enhanced whiteness. By the later part of the century, whilst the dominant white aesthetic remained, washes were prescribed more often, usually as part of the morning toilette. This suggests that a more prominent part was now played by water and washing in beauty routines. 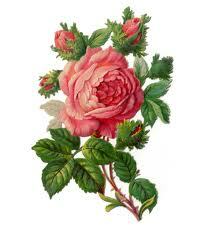 This recipe is from the text Abdeker, Or the Art of Preserving Beauty which was directed primarily at perfumers. "Spanish white" is "magistery of bismuth" [a white precipitate of bismuth subnitrate] which in this instance is blended with a cosmetic oil ("Oil of Ben"). Abdeker states that, "If it be dissolv'd in Flower-de-Luce Water, it will whiten the face", which is difficult to interpret: is it just that the pigment could be mixed with toilet water and used as a whitening wash or was it that the cosmetic was pre-prepared with oil for texture and translucency, then applied with the addition of water? Madame Isis had trouble blending with water, but using it neat produced something rather shiny and unpleasantly sticky. 2. An "excellent cosmetic for the face"
Again from Abdeker. This preparation contains Hartshorn, ceruse, rice powder and Arabic gum, and this time the recipe clearly stipulates dissolving the ingredients in rose-water and using as a wash. This one is blended with a pomade rather than the water-based washes suggested by Abdeker, the primary ingredient being "pearl-powder" (which could mean bismuth rather than actual pearls). This created a whitening cream. This recipe is clearer; powdered white pigment is mixed with tragacanth water, a kind of gum prepared from a root. It can then be stored in a dried form and mixed with a pomade to actually apply. The result is a white shiny foundation cream to which rouge easily adheres. "When the white powder is covered with traganth (?tragacanth) water, stir them well through and through with a glass spoon until it has become a thick paste, and spread it onto a piece of white paper which has been strewn with the white paint before. Separate small amounts of the size of a pea from it, then dry them in a place that is protected from dust and keep them in a box. In order to use them, do as follows. Firstly, prepare a good pomade. Now take the dried pellets of white paint, put some in a small porcelain bowl, pulverize them with a glass spoon and add of the pomade, and mix it well. When you need it, spread some of it evenly on the face, and wipe any surplus away with blotting-paper. This will make the face shiny and enables it to receive the red paint." Red pigment was derived from minerals such as cinnabar (mercuric sulphide, called vermillion) or red lead. It could also be made, rather more safely and inexpensively, from vegetable matter, such as safflowers (catharme), saffron, gum benzoin (wood resin), sandalwood, and brazilwood. One of the most expensive dyes was carmine made from cochineal insects found in Latin America. 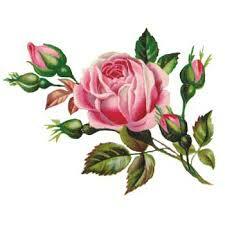 Dyes were originally combined with vinegar or lemon, precipitated on powder using alum, and then scented with flowers. They could then be combined with a pomade and rubbed in or, alternatively, mixed with rose water or oil and applied using a brush (as Madame de Pompadour does in the Boucher portrait). Rouge could also be made au crépon, dying a cloth or paper with cochineal that could be moistened and rubbed on the face. "It is well known that rouge is nothing more than the mark of rank or wealth, because it cannot be supposed that anyone has thought to become more beautiful with this terrible crimson patch. It is surprising that such distinction has been attached to a colour so common and inexpensive that even the lowliest grisettes can make this expenditure as abundantly as a person of the highest birth." These recipes from the German give details of how to create the base red dyes from Turkish safflower and powdered cochineal. "Fine Carmine, pulverized and prepared for for this purpose [rouge], is without doubt the best of all Paints, and which the Ladies ought to adopt. In order to use it in an agreeable and frugal manner, procure some fine pomatum, without scent, made with the fat of pork and white wax; take about the bigness of a pea of this pomatum, and lay it upon a piece of white paper; then with the end of a tooth-pick add to it about the bigness of a pin's head of Carmine— mix it gently with your finger, and when you have produced the tone you wish, rub in it a little compressed cotton, and pass it on the face, till the Paint is quite spread and it no longer feels greasy. Ladies have nothing to fear from this economical Rouge—it neither injures the health or skin, and imitates perfectly the natural colour." 2. French Rouge,—Five Shillings per Pot. Another recipe from Hannah Glasse. Rather than blending with a pomade, this suggests adding the carmine to hair powder. This is quite interesting as face powder per se features very infrequently in these preparations. From the Toilet of Flora (1771) This one uses brazilwood shavings, alum and red wine to create a dye that can just be rubbed in. Madame Isis' toilette. This is a great blog from someone who recreates 18th-century costumes and cosmetics. 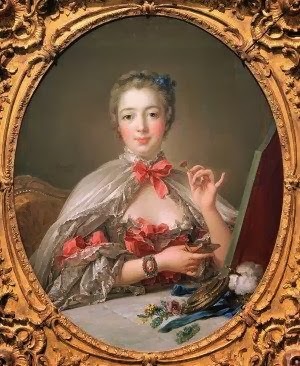 Melissa HYDE, The "Makeup" of the Marquise: Boucher's portrait of Pompadour at her toilette" The Art Bulletin, Vol. 82, No. 3, (Sep., 2000), pp. 453-475. Dominique PAQUET ''Le fard cache les nuits de folies'' L'EXPRESS - Histoire de la beauté: 4. Les XVIIe et XVIIIe siècles.